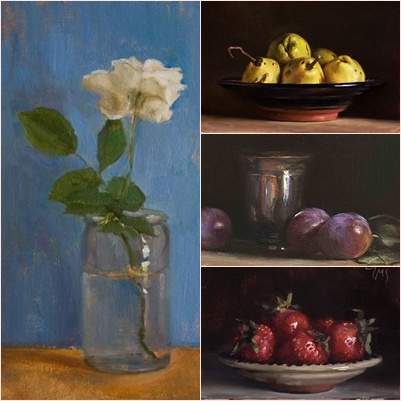 Clockwise from left: "White Rose in a Jar", "Quinces in a Spanish Bowl", "Still life With Plums and Silver goblet", and, "A Dish of Strawberries"
Also, because he draws landscapes, here's "Mill House on the Sorgues"
8" by 5" (20cm by 30cm), Oil on Board. 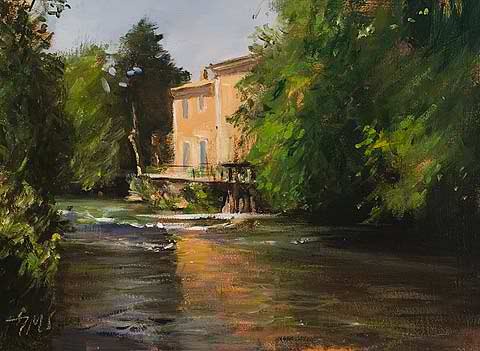 Julian Merrow-Smith is a brilliant daily painter. He and his wife jointly run "Postcard from Provence", a blog featuring his Art. They currently live in South France, on a farmhouse, with three cats. He has been producing and posting his beautiful paintings, usually small, for eight years now. He paints still lives (objets trouvés), pottery, and seasonal produce from the local markets. Whilst many of his landscape paintings represent scenes within walking distance of his studio. The blog sends 30,000 e-mails a week, and you can help support them by buying an original, a print, or by donating to them.